Loake was founded in 1880 - and they are still making shoes in Kettering under the careful direction of the Loake family. 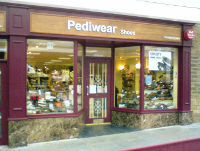 One of the most recognisable names in English shoe making, the brand is famous worldwide for the quality of their shoes. Loake export restrictions now in place to Australia, Canada, Chile, Hong Kong, Japan, New Zealand, Russia, South Korea and the USA.Loake Last Information - see our 2013 Blog article for information on the different Loake lasts.Loake Stock Information - see our recent news item for an update regarding Loake & Pediwear. No detail has been compromised in this premium range of luxurious and elegant bench made Loake shoes, produced using time-honoured shoemaking techniques that can be traced back more than 120 years. Only the very best hand burnished calf leather. Fine, Goodyear welted footwear for women. From Chelsea boots to brogues - all filled full of Loake goodness. A wonderful opportunity to wear a pair of Loake shoes. Each style in this comprehensive collection of handmade Loake shoes has been carefully designed to provide the very best fit and performance in wear. An excellent example of Loake`s aim to produce the most handsome, comfortable and durable shoes possible. The non-welted techniques used to make these Loake Lifestyle shoes can be traced back to when Loake first started making shoes - using a variety of leather finshes, leather-built heels, leather linings and insoles. Designed in England, classic styling in a comprehensive range of Loake shoes. Loake`s aim is to offer reassuringly understated designs that don't compromise quality, performance or good looks. Hand Crafted in India. Loake Shoe Trees, Loake Valet Boxes and Loake Polish.